Welcome to another Chronicles of Elyria Update. It's been a couple weeks since our last update so we've got quite a few things to share and talk about. All good, and all signs of growth. So let's go ahead and get to it! To begin with, one week ago on Tuesday, October 4th we released our latest video of Chronicles of Elyria. This one, titled A Living World, is our first video showcasing something in the world besides flora. With lounging Canis Rabbits, herding Trison, Elyrians going about their daily business, and an environment that will take your breath away, this video hits home and shows the first real glimpse at the depth and richness of life in Chronicles of Elyria. In addition, it displayed some fantastic panoramic shots of the region known as Titan's Steppe, giving you an idea of exactly how massive the world is. Keep in mind, everything in the video is real terrain, real flora and—in the final release of the game—will be fully explorable. And at only 8 km x 12 km, everything you can see in the video, from horizon to horizon, represents just .2% of the starting continent. If you missed the video last week, feel free to watch it here now. We're still a long way out from the release of the game, but the video does show that we're making progress and the world is gradually coming to life. If you're like me, it's very exciting to see the direction the game is headed. More videos coming as we flesh out more of the systems. The other major event from the last two weeks is the launch of the online store! Yes! If you previously backed the game on Kickstarter and are now looking to spend your over-payment credits on add-ons, or want to upgrade to a higher-level tier, now's the time! If, for some reason, you were unable to back during the Kickstarter but wanted to, the store is now open. Feel free to head on in and grab your title, lands, and backer rewards, by purchasing a Pledge Package in the store. While the store is online, we are hearing reports that some people are still having some trouble purchasing from the store without a little leg-work. You see, when a merchant goes online without previous credit history, no previous history of transactions, etc. and starts selling globally across the planet, with purchases ranging from $10 to $10,000 it sets off alarm bells with major fraud prevention systems. As a result, PayPal, some credit card companies, etc. are blocking the transactions. It's not their fault, they're doing precisely what they're supposed to be doing. Protecting your money. However, in this case, our Merchant of Record, Xsolla, is a trusted international merchant and there's no fraud involved, but the fraud systems are blocking the transactions anyways. The best way to resolve the issue is to email Xsolla via their support system or, better yet, just call your credit card company or Paypal and let them know you're going to be making a transaction and the amount of the transaction and ask them to let it go through. That's it! As time goes on and more and more transactions happen, the fraud protection systems will begin to relax a bit as they recognize patterns in our transactions and start to trust the payment requests. In the meantime, if you try to make a payment and are blocked, you'll have to work with your payment processor or Xsolla to move forward. Because we're not the Merchant of Record, there's literally nothing we can do to make the transaction succeed at this point. The other thing I wanted to quickly touch on was Total Influence Points vs. Spendable IP. As we mentioned before, your Total Influence Points is an indication of your influence in helping to make CoE successful. There are many ways to gain Influence Points, including purchasing things in our store, positive contributions in our forums, tracking down bugs, etc... All of those serve to make you more influential. While you can earn IP it's also possible to spend IP. As you spend IP your Spendable IP goes down, however you're no less influential in our success, so your Total Influence Points won't go down. Think of Total Influence Points as a record of all the IP you gained, through whatever means, without reducing it by your spendable amounts. That all said, if you buy a pledge package, your Total Influence goes up by the amount you spent x10. So if you spend $120, your Total Influence goes up by 1,200. However, of that, 1,100 of the IP immediately gets “spent” on the rewards you received as part of the pledge package, leaving you with 100 spendable IP. Likewise, if you spend $100 and buy the 1250-IP add-on, your Total Influence goes up by 1,000, however your spendable IP goes up by 1250. Don't think too hard about it. It may be easier to think of them as two different things. One is a measure of how influential you are, the other is a currency you can spend. That's all well and good, but where's my Spendable IP listed? It isn't yet. We're working on the Influence System right now to add in spendable IP from other systems, as well as to get ready for the IP store opening in November. As soon as we've got the system live you'll be able to see in the shop your spendable IP. When a new MMORPG opens their doors on day 1, the world is filled with settlements, NPC merchants, trainers, and quest-givers. There are also stories unfolding in the world around you for you to participate in. Chronicles of Elyria is similar, at least from the user-experience of those who join the game on launch day. But it is different. When launch day comes along, there will be settlements, however many of them will be player-customized if not player-built. There will be blacksmiths, merchants, and shop-owners, but they'll be players, not NPCs. And while there will be trainers in the world that players can seek out to learn patterns and techniques from, there won't just be NPC trainers. Many of the early players will also have access to limited-access techniques and patterns as well. The process of populating the world with settlements, allowing players to set up their shops and businesses, and advance the stories that are unfolding in the world around others is called Exposition. It's the three-month period of time before the game officially launches. But how do you gain the land, buildings, resources, supplies, and patterns and techniques necessary to be the land owners, shop keepers, and trainers at launch? That's what the IP store is for. We use the IP store as a way to seed the world with the settlements, guilds, schools, merchants, and crafters of the world. As a result, when the IP store opens, what you'll find are things that allow us to fulfill those objectives. You'll find things like parcels of land, starter packs for different roles, animals for breeding, mounts for riding, building patterns for settlements, resources for developing your skills, and even patterns and techniques so you can become a skilled artisan who others will look to when they want to advance themselves. In many cases the items will remain in the IP store indefinitely but, in some cases, such as patterns and techniques where we want to limit the number of people in the world who have that knowledge at launch, the items will only be available for about a month. After that, the only way to gain that knowledge will be to seek out a trainer in Exposition or after launch. Death, ZRO, Scarlet, and Heat are all busy putting together the graphics and tables necessary for the IP store. As we get the content created, we'll share it with you so you can see for yourselves what'll be available beginning in November. During a previous update we described our layaway system. It was initially designed to work just like the overpayment model of the Kickstarter. People could spend beyond their tier's price, and then use that money later on in any way they wanted. However, as people pointed out... that kinda sucked and is mostly useless if you can't lock in your tier prices now. We heard you, and we've made changes. ZRO and I are currently working on changes to the website to support a smarter layaway system that'll allow you to pick a tier, pay down a minimum of 10% of the tier price, and lock in that price indefinitely. Then, over the next year you'll be able to spend down a minimum of 10% at a time until you've paid off the package. You won't gain the benefits of the tier or any of those beneath it until you pay off the full price, however it does guarantee you get the Kickstarter price and benefits for the reward tier. And prices will go up. Beginning in November we're collapsing many of the tiers down, reducing it from 19 packages to 12, and in doing so adding value to many of them. As a result, the cost of most of the packages will be going up proportionally, with the Count and Duke tiers seeing the largest increase. So if you plan to pledge as a Duke or Count, you'll want to lock in your price in October. Gifting, Transfers, & Tokens... Oh my! Along with the Layaway system, we're currently working on the Gifting, Transfers, and Tokens system. This system will allow you to look at what things you've purchased in the online store and transfer them to others. This could be pledge packages, tokens, or even IP-based items you'd like to gift to others. We're still working out the details on the system, but when we know more we'll share. Another question we've been hearing a lot is whether or not we plan to open up the Design Experiences as individual items rather than being part of Pledge Packages. We're undecided, but it currently doesn't look good. The main reason for making them independent purchases is to make them more accessible to players. The problem is, we can't afford for them to be more accessible. We set them at the reward tiers we did because, unlike many of the other rewards we offer, design experiences are expensive for us. Take, for example, the Weapon Master Design Experience. This requires our concept artist to work with you to create the general concept of the weapon or shield. Then a 3D modeler has to create a model for it, texture it, and define the material. Then our designer has to figure out what the crafting requirements are for the item, as well as work out the mathematical model behind the item. What's the durability of the item? How is it effected by different construction materials or processes? If it's a weapon, which other types of weapons and armor is it strong or weak against? If it's a new weapon that doesn't fall into an existing weapon category, we may even have to make new combat animations for it. Hopefully you get the point. Even something as simple as a new weapon can range from a day or two, to as much as a week to get all the pieces right. It's not hard to do the math and realize that it's possible for us to actually lose money on a design experience if we're not smart about how we go about creating it. For that reason, we need the design experiences to remain expensive, so they can cover the costs required to create them. So even if we did make them standalone items, they wouldn't be significantly less expensive than they are now. Maika is a graphics designer by trade and has been in the games industry for the last 8 years, working for companies like Big Fish Games and Unikrn. She's been on the marketing side of the games industry as well and has worked on print and digital media, booth designs ranging from Casual Connect and PAX Prime, to web and mobile marketing campaigns. Maika joins the CoE team in both the Outreach and UI/UX teams, where she'll be creating not only marketing materials, but much of the UI for the game as well. Vye joins the team as our Sr. Producer after working for Zynga, Amazon Game Studios, and of particular interest, The Amazing Society, where she worked on the MMO Marvel Super Hero Squad Online. Vye is a voracious MMO and table-top RPG player herself, takes the player experience very seriously, and joined Soulbound Studios to ensure we're able to deliver on the promises we made to the players. In addition, Vye has said she is looking forward to creating and fostering amazing new narratives within Chronicles of Elyria with the other folks here at Soulbound Studios. Having talked quite a lot about the Production side of things, there's not a whole lot new to talk about with respect to Content and Engineering, as most of what we've been working on was visible in our recent video. That said, design has been continuing their work on the biomes of Elyria. 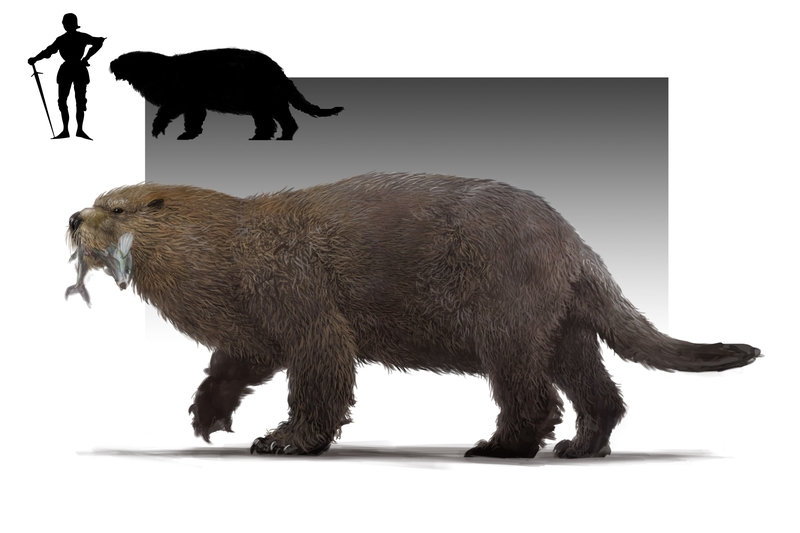 The latest creature they've been working on is the Otter Bear. The Otter Bear, taking after otters, can be found in most biomes given a river or body of water. The only biomes they wouldn't be seen in are the extremes such as the Tundra, Taiga, and deserts. They don't migrate, but they travel up and down rivers. Like most bears they're omnivorous, but prefer meat if available. They'll wait for animals to go for a drink of water and then pounce when they least expect it. Then they'll proceed to eat while floating on their backs, avoiding nuisances such as scavenger animals. That said, if necessary, they'll travel on to land in order to find a food source. They will most often either be alone or roaming in groups of 3-5. Generally docile towards humans, they have playful attitudes with one another and are tamable. If provoked, however, such as threatening their young or explicitly attacking them, they are relentless and are a considerable threat thanks to their agility in both water and on land (Google 3-clawed otters). That’s all for now. The office is starting to become pleasantly crowded, and the game is beginning to swarm with new life. In the coming weeks we’ll continue to work on new features for the store, as well as continue making progress on the Prologue offline demo. With Vye joining us, and with us continuing to hire, we’ll soon be transitioning from Pre-Production into Production. And nobody is more excited to see what the team is fully capable of when we enter full production than me. That otter bear is a great creature, makes me want one as a pet! I'd say the otter bear looks really cute, but I'd just feel that much worse when it potentially kills me later, so I won't. For now. I find I am so absorbed in playing video games. I don't think it's right. Typically, people fail to stick to their goals because their resolutions are too demanding or unrealistic, like quitting playing video games. I bought myself a beginner metal detector kit from the webside. (http://www.kingdetector.com/) I want to do a exploration of nature as a travel. Posted By **eMadagio** at 02:00 AM - Mon Oct 17 2016 > > At least Caspian noticed you. ;-; NOTICE ME AGAIN SENPAI! Simple and intuitive / menu structures and navigation. AI selection ie pick from pre-approved scripts or select own if applicable. PS. It all looks awesome. Great work. On the subject of UIs what are the current thoughts or plans for how it will look and feel? For example: * Simple and intuitive / menu structures and navigation. * Transparencies / In game triggers to access menus * Themes (ie one theme, or wood feel, corn field etc) * AI selection ie pick from pre-approved scripts or select own if applicable. PS. It all looks awesome. Great work. Been waiting weeks for a developer journal and all we get is a big otter. Fantastic. Yeah but it's also a bear. Posted By **Chekhov** at 12:17 PM - Sat Oct 15 2016 > > Been waiting weeks for a developer journal and all we get is a big otter. Fantastic. Yeah but it's also a bear. By that you mean the video in the OP isn't being displayed for you? The video can alternatively be found on their youtube channel. When will the layaway option be available? I have this wierd feeling I'm being ignored for some reason. Any question or idea i have aboutbthe game gets completely ignored . I think that the studio folks read through the forums. I've addressed things to them myself but don't expect a written reply back generally. I understand when they can't and don't have hurt feelings. They are busy people trying to make a game and they don't have time to answer every person's question or provide feedback for every idea. If some questions merit further details, perhaps we get answers in an upcoming weekly update. Try not to sweat it. Posted By **TheBlackGriffin** at 01:02 AM - Fri Oct 14 2016 > > I have this wierd feeling I'm being ignored for some reason. Any question or idea i have aboutbthe game gets completely ignored > . I think that the studio folks read through the forums. I've addressed things to them myself but don't expect a written reply back generally. I understand when they can't and don't have hurt feelings. They are busy people trying to make a game and they don't have time to answer every person's question or provide feedback for every idea. If some questions merit further details, perhaps we get answers in an upcoming weekly update. Try not to sweat it. Requesting IP for every idea probably isn't helping your cause. In regards to the fantasy biome though: considering they already have unique fauna then unique flora that could create more fantastical looking biomes could definitively be a thing, however, don't expect the places to actually be magical as the game is low-fantasy. Posted By **TheBlackGriffin** at 10:02 AM - Fri Oct 14 2016 > > I have this wierd feeling I'm being ignored for some reason. Any question or idea i have aboutbthe game gets completely ignored . Requesting IP for every idea probably isn't helping your cause. In regards to the fantasy biome though: considering they already have unique fauna then unique flora that could create more fantastical looking biomes could definitively be a thing, however, don't expect the places to actually be magical as the game is low-fantasy. Then how do you suppose i should "Influence" the creation. And what do you mean by "not helping your cause". I mean, atleast I'm openly honest about the fact that i love the game and wanna just get enough IP for ONE spark of life ATLEAST! If you love the game why not spend the 30 dollars to fund it? Yes, providing ideas that alter the game does possibly mean you could get awarded IP, but as Caspian said assume you aren't getting IP just because you throw a random idea out there. A fully fleshed out system that blows SBS's mind and alters how they conceptualized something...yeah that probably would do it. Huh, i didn't think about it like that, if that's how i should be doing it, then I'll try. Buy one of the tiers in the shop, that's what the rest of us do. The best way to make sure they can actually make the game is by ensuring they have the cash to do so.. We honestly don't need new ideas for this game atm. Most of us would already love it if they can implement only their current ideas, which will be hard enough as it is. Let's give them what they need to do so. Even if you don't have enough money to buy a tier at the moment, save up some or use the layaway system when it is implemented. Posted By **TheBlackGriffin** at 10:51 PM - Fri Oct 14 2016 > > Then how do you suppose i should "Influence" the creation. And what do you mean by "not helping your cause". I mean, atleast I'm openly honest about the fact that i love the game and wanna just get enough IP for ONE spark of life ATLEAST! Buy one of the tiers in the shop, that's what the rest of us do. The best way to make sure they can actually make the game is by ensuring they have the cash to do so.. We honestly don't need new ideas for this game atm. Most of us would already love it if they can implement only their current ideas, which will be hard enough as it is. Let's give them what they need to do so. Even if you don't have enough money to buy a tier at the moment, save up some or use the layaway system when it is implemented. I don't mean to ask much, but i was hoping there are multiple fantasy style biomes in the game. I know this game isn't a full fantasy game, but id like for some beautiful enchanted forest, or a forest with trees in which you could home a city(like ewoks) all the way till dark scary forsets and a gigatic patch of land in scorches like the fire kingdom in adventure time. It doesn't have to be extremely magic looking, it could be slightly realistic as well. I don't think it's worth IP, you haven't really done anything besides say "I want something that other games already have". In other words, you went into a kitchen and told the Chief "I want something good to eat." when there's already an entire menu of great food. If you're going to say this ideal is worth a reward of some sorts, at least put more effort into it. Drawings, specifications, ect.... elaborate on WHY it should be there. Anyways, as others said, they need more help with funding to implement all the amazing ideals they already have. So visit the store. I don't think it's worth IP, you haven't really done anything besides say "I want something that other games already have". In other words, you went into a kitchen and told the Chief "I want something good to eat." when there's already an entire menu of great food. If you're going to say this ideal is worth a reward of some sorts, at least put more effort into it. Drawings, specifications, ect.... elaborate on WHY it should be there. Anyways, as others said, they need more help with funding to implement all the amazing ideals they already have. So visit the store. We have our own ideas for what landscapes, biomes, and environments exist on the surface (above and below) Elyria. In general, we don't award IP for game ideas. We have our own ideas, and don't want to get into the habit of having to defend our ideas as our own against IP-hungry players. If you share an idea with us here on the forums, assume there's no IP reward for it, even if we elect to use it. If we decide to award you IP for it, you can be pleasantly surprised. Did anyone else catch the below surface part of Caspian's post? The possibilities warp my mind. Posted By **Caspian** at 6:24 PM - Fri Oct 14 2016 > > @TheBlackGriffin > > We have our own ideas for what landscapes, biomes, and environments exist on the surface (above and below) Elyria. > > In general, we don't award IP for game ideas. We have our own ideas, and don't want to get into the habit of having to defend our ideas as our own against IP-hungry players. If you share an idea with us here on the forums, assume there's no IP reward for it, even if we elect to use it. > > If we decide to award you IP for it, you can be pleasantly surprised. > > Thanks! > Caspian Did anyone else catch the below surface part of Caspian's post? The possibilities warp my mind. Great, now im the "Lazy-Reward-wanting-greedy-idiot-that no-one-likes" guy. Posted By **Oracle** at 2:21 PM - Sun Oct 16 2016 > > Posted By **Caspian** at 12:24 AM - Sat Oct 15 2016 > > > > > @TheBlackGriffin > > > > We have our own ideas for what landscapes, biomes, and environments exist on the surface (above and below) Elyria. > > > > In general, we don't award IP for game ideas. We have our own ideas, and don't want to get into the habit of having to defend our ideas as our own against IP-hungry players. If you share an idea with us here on the forums, assume there's no IP reward for it, even if we elect to use it. > > > > If we decide to award you IP for it, you can be pleasantly surprised. > > > > Thanks! > > Caspian > > Always the best outlook. Anything I've done, I've done with the expectation of no reward, with the goal being simply to help the game along where I can. If the game is a massive hit and we wind up with millions of fans when launch arrives, fantastic. I win either way as I want the game to be a success. If I manage to earn some sort of IP rewards in the process, great. Bonus :) > > > Great, now im the "Lazy-Reward-wanting-greedy-idiot-that no-one-likes" guy. Woot. Not really, I'm sure most of us figured you struggle to back the game on your own and was trying to be resourceful. Which isn't a bad thing. :3 However, you can't invest in any backing tiers with IP anyway, so that route was a bit moot. Posted By **TheBlackGriffin** at 10:14 PM - Sun Oct 16 2016 > > Great, now im the "Lazy-Reward-wanting-greedy-idiot-that no-one-likes" guy. > > Woot. Not really, I'm sure most of us figured you struggle to back the game on your own and was trying to be resourceful. Which isn't a bad thing. :3 However, you can't invest in any backing tiers with IP anyway, so that route was a bit moot. Thanks for clarifying, makes a lot of sense! Sometimes I feel -- and let me know if that isn't a shared feeling -- that some players focus a tad too much on IP. While I understand that IP will be extremely interesting and powerful in terms of building things at the onset of the living, breathing world, it feels to me like it won't be as important as the actions of those who then take the world to carry it over the subsequent several months. Maybe I see this the wrong way. Posted By **Caspian** at 7:24 PM - Fri Oct 14 2016 > > @TheBlackGriffin > > We have our own ideas for what landscapes, biomes, and environments exist on the surface (above and below) Elyria. > > In general, we don't award IP for game ideas. We have our own ideas, and don't want to get into the habit of having to defend our ideas as our own against IP-hungry players. If you share an idea with us here on the forums, assume there's no IP reward for it, even if we elect to use it. > > If we decide to award you IP for it, you can be pleasantly surprised. > > Thanks! > Caspian Thanks for clarifying, makes a lot of sense! Sometimes I feel -- and let me know if that isn't a shared feeling -- that some players focus a tad too much on IP. While I understand that IP will be extremely interesting and powerful in terms of building things at the onset of the living, breathing world, it feels to me like it won't be as important as the actions of those who then take the world to carry it over the subsequent several months. Maybe I see this the wrong way. I have a good feeling for Maika "Scarlet", please make this game basic ui to something amazing. Will the november packages be shown before they switch? I was thinking of upgrading to bloodline or so but if the new packages in november fit what I'm after better I would love to know. Hate buying something with stuff I don't want just because it is the only thing with what I do want. Then three days later seeing them sell it exactly with what I was after. Will the november packages be shown before they switch? I was thinking of upgrading to bloodline or so but if the new packages in november fit what I'm after better I would love to know. Hate buying something with stuff I don't want just because it is the only thing with what I do want. Then three days later seeing them sell it exactly with what I was after. Here's a question, does taming also include the "You save my life i help you for eternity" thing? That'd be something great. If it's not implemented but you like the idea, it would be great if i see a number greater than 0 in my total IP count, which has basically been the same since the start . Here's a question, does taming also include the "You save my life i help you for eternity" thing? That'd be something great. If it's not implemented but you like the idea, it would be great if i see a number greater than 0 in my total IP count, which has basically been the same since the start . Thanks for sharing so much info and clearing things up! Keep up the good work, devs! Otter bear? Can you ride it? Yes. I'm sold. Love it all, thanks for the new info!! Thanks eMadagio, I should have been more clear. I can see it in this thread, I just had not seen it posted anywhere previously. The video was embedded in his post. Here's a YouTube link if it didn't show up for some reason. The video was embedded in his post. Here's a [YouTube](https://www.youtube.com/watch?v=sCa5MZ5oy0s) link if it didn't show up for some reason. In this update Caspian says "If you missed the video last week, feel free to watch it here now." I do not see that video on this site in the Media tab, the News tab, nor the Dev journals tab. Like most I am hungry for any scrap of new info. Where was this posted last week? It was communicated on IRC and Discord, as well as their YouTube and Twitter accounts. Is the April on Kickstarter a typo, or is something also happening in April, it says November here. It was a typo. I'm not sure where it came from, but it's November. I've edited it to say November. It certainly shall be done. Mew shall send forth those who through their actions [criminals] volunteer to test this and other matters in intricate detail. We'll be a technocracy after all, where everyone has a purpose. For progress and prosperity of the greater all. Question: Considering the size of the Otter Bear, will it be mountable when tamed? I'm sure it won't be nearly as fast as an equine mount, but it would be cool if we could use it as a river crossing mount. **Question:** Considering the size of the Otter Bear, will it be mountable when tamed? I'm sure it won't be nearly as fast as an equine mount, but it would be cool if we could use it as a river crossing mount. Just hop on its back and try. What could possibly go wrong? Posted By **ShadowTani** at 1:22 PM - Wed Oct 12 2016 > > **Question:** Considering the size of the Otter Bear, will it be mountable when tamed? I'm sure it won't be nearly as fast as an equine mount, but it would be cool if we could use it as a river crossing mount. Just hop on its back and try. What could possibly go wrong? If ive gotten an idea, and its a good one, will i get IP please? Regarding the design experience, i still think that you guys could use some time to produce some sort of manual/tool with instructions and parameters to the comunity in order to benefit from a colaborative game design. Just look at the modding comunity of some games and what they've achieved... But let's not change the subject here... keep up with the work and welcome to Vye and Scarlet. This IP system worries me. If you do things with these points, more money, more things. In the first generation, it seems like a good idea (get a living world, with a hierarchy already built), but a poorly built inheritance system can generate perpetuation of power (power achieved with real money). During kickstarter was required $25, at least to have access to the game, I do not think is fair that access can now be achieved for $10 (store's elyrian tier), even that does not include beta. This IP system worries me. If you do things with these points, more money, more things. In the first generation, it seems like a good idea (get a living world, with a hierarchy already built), but a poorly built inheritance system can generate perpetuation of power (power achieved with real money). During kickstarter was required $25, at least to have access to the game, I do not think is fair that access can now be achieved for $10 (store's elyrian tier), even that does not include beta. I have not pledged yet, still trying to determine what I want to do. But the lowest tier that is visible to me, the Elyrian Tier is $35. You have already invested $25 so the $10 that you see is the difference between those two. At this point, for you, anything in the store will show $25 less than it shows for me. Posted By **kurah** at 1:51 PM - Wed Oct 12 2016 > > This IP system worries me. > > If you do things with these points, more money, more things. In the first generation, it seems like a good idea (get a living world, with a hierarchy already built), but a poorly built inheritance system can generate perpetuation of power (power achieved with real money). > > During kickstarter was required $25, at least to have access to the game, I do not think is fair that access can now be achieved for $10 (store's elyrian tier), even that does not include beta. > > I have not pledged yet, still trying to determine what I want to do. But the lowest tier that is visible to me, the Elyrian Tier is $35. You have already invested $25 so the $10 that you see is the difference between those two. At this point, for you, anything in the store will show $25 less than it shows for me. Hopefully that made sense. I think and hope you are right. @Kurah not sure if you got to confirm this for yourself but choctaw is right. It will only show the difference between your current amount of money backed with whatever tier you are looking to buy. That's right. King tier is 9,975 to me. I had not noticed, it's a relief. Can you gift just the title (with CoA and Cloak) to someone without gifting the entire pledge tier? When gifting something to someone do they move up the Influence Chart equal to the value of the gift while you move down equal to the value of the gift, or would they need to make their own purchases to go up in the pick order? The main reason I ask is that it would be silly for someone who is a count to want to purchase another county to have a larger county, to not get the influence chart influence increase because they had to purchase the second package on another account and then gift it over. Also, we have a number of people looking to do just that in our group but are waiting on an answer so I figured I would ask for them. Additionally we have a couple who want to buy packages for their friends but arent sure how the gifting will work there either. Will they rise in the pick order by adding all of the packages bought from their other accounts to their main account, and then when they gift, (just the titles), to their friends does their influence chart position drop down? When gifting that title to the friend do they get any influence chart influence for their pick order or are they basically last pick and they can purchase IP / bring people into game to get themselves up to the race if they feel the need to? What are the Tiers going away and what are the prices going up to? Will they release the prices for the IP store before they launch it? I'm thinking of buying some extra IP at the moment but because I don't know how much things will cost I don't know how much I need to buy. I'd be prepared to spend extra money on IP if I knew it was going to result in me being able to buy something really good in the IP store but if I don't know the prices I'm unlikely to spend that amount of money on IP. Edit: Also welcome to the team new employees :). The more I read about this game the more I really want to play it. Will they release the prices for the IP store before they launch it? I'm thinking of buying some extra IP at the moment but because I don't know how much things will cost I don't know how much I need to buy. I'd be prepared to spend extra money on IP if I knew it was going to result in me being able to buy something really good in the IP store but if I don't know the prices I'm unlikely to spend that amount of money on IP. Edit: Also welcome to the team new employees :). The more I read about this game the more I really want to play it. I'm with you on this one. They offer a bonus for buying IP right now, but we don't what we are buying IP for? "Hey do you want to buy this thing? It's awesome! ...oh, what is it? Well, I can't tell you that right now, but you should buy it!" Would it not make more sense to pop those charts up early? That would encourage a LOT more people to purchase IP right now with the bonus that you get. I want to buy more IP then my tier gets, but what am I actually buying it for!? This sincerely bothers me that SBS thinks that this is the correct order to do these things. Posted By **Cromulent** at 11:22 AM - Wed Oct 12 2016 > > Will they release the prices for the IP store before they launch it? I'm thinking of buying some extra IP at the moment but because I don't know how much things will cost I don't know how much I need to buy. I'd be prepared to spend extra money on IP if I knew it was going to result in me being able to buy something really good in the IP store but if I don't know the prices I'm unlikely to spend that amount of money on IP. > > Edit: Also welcome to the team new employees :). The more I read about this game the more I really want to play it. I'm with you on this one. They offer a bonus for buying IP right now, but we don't what we are buying IP for? "Hey do you want to buy this thing? It's awesome! ...oh, what is it? Well, I can't tell you that right now, but you should buy it!" Would it not make more sense to pop those charts up early? That would encourage a LOT more people to purchase IP right now with the bonus that you get. I want to buy more IP then my tier gets, but what am I actually buying it for!? This sincerely bothers me that SBS thinks that this is the correct order to do these things. P.S. The layaway feature should be implemented in the next couple weeks from what I can gather. You could opt for the "layaway" option once that is implemented and pay the $150 over the course of a year. You just have to pay 10% essentially a month ($15). So....pay it over the course of 10 months I guess. Posted By **Kalfax** at 10:39 AM - Wed Oct 12 2016 > > i'd buy the 150 dollar package if the store for it lasted longer, i want the merchant one but this months no good for me. :( if it lasted like 3 months id buy that.. but instead ill probably go with the 35 dollar one coz its such a limited time. boo You could opt for the "layaway" option once that is implemented and pay the $150 over the course of a year. You just have to pay 10% essentially a month ($15). So....pay it over the course of 10 months I guess. Thanks for making our childhood dream game a reality! Welcome to the Team ladies! Thanks for making our childhood dream game a reality! LISTEN TO THIS MAN. HE SPEAKS TRUTH! 1) We're working on the Influence System right now to add in spendable IP from other systems, as well as to get ready for the IP store opening in November. 2) Death, ZRO, Scarlet, and Heat are all busy putting together the graphics and tables necessary for the IP store. As we get the content created, we'll share it with you so you can see for yourselves what'll be available beginning in April. If the store open in November but we only get the IP Tables in April what will be in the store in November ? Sorry, i'm confused about some of the informations given in this DJ : 1) We're working on the Influence System right now to add in spendable IP from other systems, as well as to get ready for the IP store opening in November. 2) Death, ZRO, Scarlet, and Heat are all busy putting together the graphics and tables necessary for the IP store. As we get the content created, we'll share it with you so you can see for yourselves what'll be available beginning in April. If the store open in November but we only get the IP Tables in April what will be in the store in November ? I might have understood it wrong, it might be that in April we'll see the first non permanent Ip products or it's a typo.... Help. Awesome update, thanks for that. Welcome to the new team members and keep up the great work. Will these patterns be handed down/ known to my heir if they continue in the family trade or are they "one character use". Apologies if this had already been answered, I have been away from the forums for a little bit. Thanks for the updates as always! Correct me if I am wrong but I think they are physical patterns that can be stolen or sold. So if you die and still have the pattern then your heir would have it as well. I think thats the way it works any way. It says this on the KS page. So that implies it's a physical pattern. Posted By **Manta** at 09:25 AM - Wed Oct 12 2016 > > Question : Patterns in the IP store ( and discovered in game for that matter) > > Will these patterns be handed down/ known to my heir if they continue in the family trade or are they "one character use". > > Apologies if this had already been answered, I have been away from the forums for a little bit. > > Thanks for the updates as always! > > Cheers Correct me if I am wrong but I think they are physical patterns that can be stolen or sold. So if you die and still have the pattern then your heir would have it as well. I think thats the way it works any way. It says this on the KS page. 2- This item is destructible. That's why we've given Kickstarter backers the pattern to recreate them if lost. So that implies it's a physical pattern. Thanks for the update and the very cool videos. Welcome Scarlet and Vye! how i can change my Tier back?. The reason why i bought the merchant was that i was thinking that i get the 1500 IP to spend. After that new information i would buy the Bloodline and the 30$ for IP. Caspian said, "Death, ZRO, Scarlet, and Heat are all busy putting together the graphics and tables necessary for the IP store. As we get the content created, we'll share it with you so you can see for yourselves what'll be available beginning in April." I take that to me that the IP store is still coming out next month and we can buy these things then but the actual "pictures" of the item won't be available until April? Or are you saying the IP store is not coming out until April? Caspian said, "Death, ZRO, Scarlet, and Heat are all busy putting together the graphics and tables necessary for the IP store. As we get the content created, we'll share it with you so you can see for yourselves what'll be available beginning in April." I take that to me that the IP store is still coming out next month and we can buy these things then but the actual "pictures" of the item won't be available until April? Or are you saying the IP store is not coming out until April? You caught that too. Nice stealth edit in the post. I have my own theory of how we will be seeing things for ourselves in April. It is called Alpha 1. I am sure that SBS doesn't want to commit to even that much of a target goal date. That would be technically Q2 2017. If they are still shooting for a December 2017 launch, and have a three months of exposition, they have to squeeze in both of the Alphas and Betas before September. Anyway, welcome to the new hires. Great update. Posted By **Bokimbol** at 08:20 AM - Wed Oct 12 2016 > > Caspian said, "Death, ZRO, Scarlet, and Heat are all busy putting together the graphics and tables necessary for the IP store. As we get the content created, we'll share it with you so you can see for yourselves what'll be available beginning in April." > > I take that to me that the IP store is still coming out next month and we can buy these things then but the actual "pictures" of the item won't be available until April? > > Or are you saying the IP store is not coming out until April? > You caught that too. Nice stealth edit in the post. I have my own theory of how we will be seeing things for ourselves in April. It is called Alpha 1. I am sure that SBS doesn't want to commit to even that much of a target goal date. That would be technically Q2 2017. If they are still shooting for a December 2017 launch, and have a three months of exposition, they have to squeeze in both of the Alphas and Betas before September. Anyway, welcome to the new hires. Great update. Sorry I think there is an misunderstanding. Please correct me if Im wrong. IPStore: This is the IP what u can use to buy Buildings and other stuff for the game. IPSupport: This is the IP which u can use to messeaure Your support for the game. You only can see how much u support them and dont use this for buying. My Problem was that i diddent know about the two kind of IP. I was thinking ,, nice i get 1500 IP to buy stuff and the additional bonus from my Tier.´´ But now that i know there are two kind of Ip would choose the Bloodline and use the extra 35 $ to buy IP for theStore. Is there a list which explains what which item ca do like the caravan. So this change to the layaway system mean I can pay 10% of the money for a tier (say , the 35$ elyrian tier), get the benefits from it (pretty much getting the game in said example) while locking the sum I'll have to pay in case it rises higher in the future for 12 months? And it's all good if I pay the other 90% within 12 months, but if I don't I just "donate" 10% to Soulbound Studios? So this change to the layaway system mean I can pay 10% of the money for a tier (say , the 35$ elyrian tier), get the benefits from it (pretty much getting the game in said example) while locking the sum I'll have to pay in case it rises higher in the future for 12 months? And it's all good if I pay the other 90% within 12 months, but if I don't I just "donate" 10% to Soulbound Studios? You dont "just" donate 10%, you get the money as store credit to use on addons or merchandise. Posted By **Crimsonguard** at 12:16 PM - Wed Oct 12 2016 > > So this change to the layaway system mean I can pay 10% of the money for a tier (say , the 35$ elyrian tier), get the benefits from it (pretty much getting the game in said example) while locking the sum I'll have to pay in case it rises higher in the future for 12 months? > > And it's all good if I pay the other 90% within 12 months, but if I don't I just "donate" 10% to Soulbound Studios? You dont "just" donate 10%, you get the money as store credit to use on addons or merchandise. Nice one and a warm welcome to the new team members! Every time i read these updates they just get me more and more excited to play this game. Great update. It brought answers to questions had. Welcome to Scarlet and Vye! Now how soon with the layaway system be implemented into the store? Looking forward to more updates and ultimately game release. Awesome update, thank you and keep up the great work. Do layaway transactions begun prior to the shop phase of funding continue to contribute to stretch goals after this phase is finished? (Dec/Jan). As in, will payments made via layaway throughout 2017 contribute to the team's stretch goals, be counted toward the total in their entirety, or not be counted at all because they're not full-price donations? Regarding the weapon design experiences: Will each weapon/armour/other assorted gear piece contribution by a Chimera+ donator be something that can only be crafted in the form it's presented in, or a base schematic/design that can be innovated on? For example: If someone were to add the rope dart as their weapon choice, would players be restricted to crafting the rope dart as a rope and blade, or could we sub in axe blades, spear blades, extra blades along the rope, a stave segment, etc...; would these changes have to be stipulated by the designer/contributor, or will they be considered post-creation as a means of technical innovation/improvement on an item? That video is agonising to watch. By which I mean it's utterly amazing, but all too keen a reminder of how long we have to wait before we can play >,< I've got a couple of questions (as usual) regarding this update: - Do layaway transactions begun prior to the shop phase of funding continue to contribute to stretch goals after this phase is finished? (Dec/Jan). As in, will payments made via layaway throughout 2017 contribute to the team's stretch goals, be counted toward the total in their entirety, or not be counted at all because they're not full-price donations? - Regarding the weapon design experiences: Will each weapon/armour/other assorted gear piece contribution by a Chimera+ donator be something that can only be crafted in the form it's presented in, or a base schematic/design that can be innovated on? For example: If someone were to add the rope dart as their weapon choice, would players be restricted to crafting the rope dart as a rope and blade, or could we sub in axe blades, spear blades, extra blades along the rope, a stave segment, etc...; would these changes have to be stipulated by the designer/contributor, or will they be considered post-creation as a means of technical innovation/improvement on an item? "You won't gain the benefits of the tier or any of those beneath it until you pay off the full price, however it does guarantee you get the Kickstarter price and benefits for the reward tier." Does the system make a difference between new Tiers and already owned Tiers and benefits, that were bought before using the layaway system? For example, will a Duke, who is using the layaway to buy the King Tier, loose his already owned benefits like alpha / beta access. Or does it mean that he will only gain the new benefits of the King Tier and any Tier inbetween, after he fully paid the new Tier. can someone explain to me what Prologue offline demo is? also what will happen when the team enters in full production? Prologue: The Awakening is an offline, single-player experience that is designed to act as a hands-on test of some of our most important client feature areas. It ties in closely with our "Rope Bridge" philosophy of development as it's a first opportunity to get feedback from players, even before the Alpha 1 (Pre-Alpha) release of our game client and server. Over the last couple weeks we've been defining the feature areas which will be touched during the Prologue, and currently have a set of 22 feature areas which players will get some exposure to. Posted By **myxtum** at 09:13 AM - Wed Oct 12 2016 > > can someone explain to me what Prologue offline demo is? > also what will happen when the team enters in full production? Prologue: The Awakening is an offline, single-player experience that is designed to act as a hands-on test of some of our most important client feature areas. It ties in closely with our "Rope Bridge" philosophy of development as it's a first opportunity to get feedback from players, even before the Alpha 1 (Pre-Alpha) release of our game client and server. Over the last couple weeks we've been defining the feature areas which will be touched during the Prologue, and currently have a set of 22 feature areas which players will get some exposure to. [[Source:]](https://chroniclesofelyria.gamepedia.com/Prologue:_The_Awakening) Wiki. If a previous package has already been purchased, how would that effect the price of the initial and per month payment? For example, if a Count wanted to upgrade to an Artificer via layaway, would their initial package be used to cover the initial fee and still require $250/mo or would the difference be used to reduce the cost of both the initial and per month to $200? Quick question about Layaway. If a previous package has already been purchased, how would that effect the price of the initial and per month payment? For example, if a Count wanted to upgrade to an Artificer via layaway, would their initial package be used to cover the initial fee and still require $250/mo or would the difference be used to reduce the cost of both the initial and per month to $200? So does this mean the layaway system will be in place before the price increase? Posted By **Xeryn** at 12:01 AM - Wed Oct 12 2016 > So does this mean the layaway system will be in place before the price increase? Yes. Will the ability to purchase multiple tiers/titles on the same account be implemented at the same time as the layaway system, before the price changes? Posted By **Caspian** at 12:10 AM - Wed Oct 12 2016 > > Posted By **Xeryn** at 12:01 AM - Wed Oct 12 2016 > > So does this mean the layaway system will be in place before the price increase? > > > Yes. @Caspian, Will the ability to purchase multiple tiers/titles on the same account be implemented at the same time as the layaway system, before the price changes? Oh wow Caspian answered my question! Thanks buddy! Glad to hear it! SO glad to see the new layaway system. Thanks SBS! Question about the layaway, not for myself but general availability of information. What happens if you don't manage to pay off the entirety of the locked in tier by the time the game releases? Thanks for update. Looking forward to IP tables etc. I like that otter bear, and am very pleased with the layaway option. I expect great things from you guys, and know you can deliver!